My first visit to The Flowerpot in Derby and it is one of the best I have been to for it size. Great sound system and adequate lighting and an enthusiastic crowd made for a great evening. We were not disappointed as the guys came on-stage to give us a set akin to the 'three' horsemen of the apocalypse running riot. Marcus’ younger brother Alex was depping on bass and was a revelation especially on new song ‘Jezebel’ which to my ears was the tightest musically in the set and is becoming already a crowd favourite. Kicking off with a couple of tracks from the latest cd ‘Goin Down’ and ‘Will Not Play Your Game’, Marcus throwing shapes like he is possessed, throwing out solo after solo which continued into new song ‘Baby Don’t Dance’ probably the most commercial sounding song he has written. Last song with the resonator ‘Devil Girl’ shows what Marcus is all about, stunning guitar, heartfelt lyrics and the knack to produce stunning melodies, this song I am sure will become a standard that will be covered by others in time. Fender time for another new song ‘Cheap Whiskey’ his own old school blues epic ‘Now I’m Gone’ and ‘Hard Times’ from the first cd. The pace was relentless with Marcus swigging merrily from the bottle of Jameson’s on stage while waxing lyrical with the audience with anecdotes about the song’s meanings and influences. Mad instrumental ‘Tweed Blazer ‘ brought the released songs in the set to a close. It was new song time for the rest of the set, ‘Honest Boy’, ‘Honey’, ‘Jezebel’ and ‘Alley Cat’ all received as eagerly as the well-known songs by the crowd, by this time Alex Reeves was whipping up a storm on drums, not only with the skins but the metal rims to get the right sound effect in the ‘spaces’that are sometimes neglected by lesser mortals. 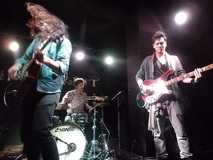 Marcus Bonfanti Band have never failed to deliver the goods on stage and are one of the best bands I have ever seen, wonderful musicians, melodies to die for, great personalities and always smiling. Goin Down/Will Not Play Your Game/Baby Don’t Dance/Devil Girl/Cheap Whiskey/Now I’m Gone/Hard Times/Tweed Blazer/Honest Boy/Honey/Jezebel/Alley Cat/Give Me Your Cash/The Bittersweet/Leave This Long-Haired Country Boy Alone.